The Paris RER is a network of city and suburban trains that pass through the center of Paris and connect with the Metro at various stations in Paris. These trains serve the City of Paris, the suburbs surrounding Paris and beyond to the towns and villages outside of metropolitan Paris. If you are arriving or leaving by one of the Paris Airports, this is the Paris Transportation system that will get you there. If a visit to Versailles or Disneyland is in your plans, the RER has convenient and frequent trains to these destinations. The Paris RER system consists of 5 lines lettered A, B, C, D and E.
Line A runs roughly east and west through Paris on the Right Bank. Within the city it makes stops at, from east to west, Vincennes, Nation, Gare de Lyon, Les Halles-Chatelet, Auber, Charles de Gaulle-Etoile (where the Arc de Triomphe is located) and ending at the La Défense station. Line B runs north and south through Paris with stops at Gare de Nord, Les Halles-Chatelet, Saint Michel, Luxembourg (next to the Palais du Luxembourg), Port Royale, Denfert-Rochereau and Cité Universite. Line B also connects to the two major international airports of Paris, Charles de Gaulle, or Roissy, to the north and Orly to the south. Line C runs east and west through Paris on the Left Bank with stops at Bibliothèque François Mitterrand, Gare d'Austerlitz, Saint Michel, Musée d'Orsay, Invalides, Pont de l'Alma, and Champ de Mars-Tour Eiffel. At the Champ de Mars-Tour Eiffel station, the line splits with one line heading south-west to Versailles and one line heading north to Pontoise and Argenteuil. Make sure that you are on the right train if you are going out to Versailles. Line D runs north and south through Paris with stops at Gare de Nord, Les Halles, and Gare de Lyon. Line E, which opened in 1999, runs from Gare St. Lazare to eastern and south-eastern suburbs. The Paris RER trains don’t run as frequently as the Metro but they go farther between stops making a trip across town quicker than the Metro. 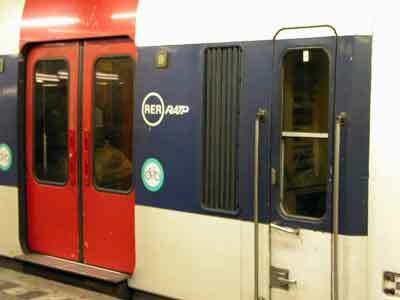 The Paris RER stops allow you, where possible, to make a transfer, called a "correspondance", with the Metro. Within Paris, the same kind of ticket used for the Metro is the same as used for the RER. If using the RER to go beyond city limits, the price of the ticket will vary depending on the distance travelled. These tickets can be purchased at the RER stations. When using the RER, the Metro or the bus, hold on to that ticket. You will often need it to exit the train or metro station. And, you will always want it with you to verify that you are, indeed, a ticketed passenger. If you do not have a valid ticket, you will be fined on the spot. The fine is 25 euros. They will take cash, credit cards or checks but they will not take excuses. For more information go to the Paris RER Official Website. Return to Top of Paris RER.